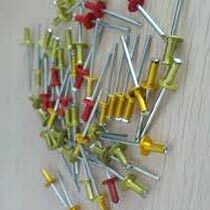 We are well-known Supplier of precision-engineered Aluminium Rivets in Delhi. We source them from certified and reliable manufacturers who use the latest technology and top grade raw materials to fabricate them. We provide Aluminium Rivets in various specifications to meet varied requirements. Buyers can purchase Aluminium Rivets at competitive prices from us. Furthermore, we make them available in bulk without compromising on quality of products.